Boyds, Md. – Spirit Academy Maryland and Virginia teams will be back on the field this weekend, seeking to build on some strong recent performances in U.S. Soccer Girls Development Academy play. Both the Spirit Academy’s MD and VA programs had multiple teams rack up points on a busy weekend from October 13-14, setting the stage for another challenging match day on Saturday, October 20. Highlighting the Oct. 13-14 weekend matchups was a dominant performance by the Spirit Academy – MD U-14s in a 5-0 win over Long Island SC. Natalie Adams recorded a hat-trick in the victory, with supporting goals by Sydney Bolinger and Brooke Hunter. Adams set the match pace, knocking her first goal of the match in the 1st minute and didn’t show any signs of slowing down as she scored goal number two in the 6th minute and locking her hat-trick in the 50th. On the defensive end, the U-14s captured their 4th clean sheet in their last six matches, earning five wins and one draw in that timeframe. 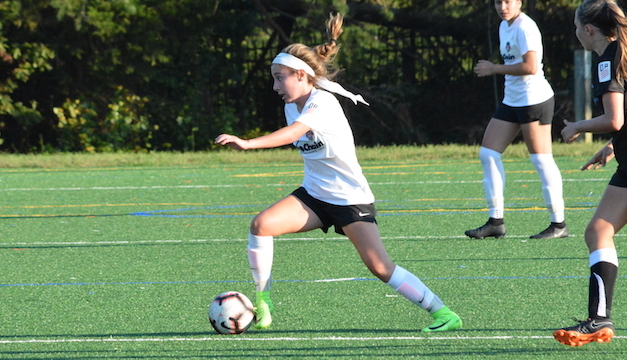 After falling 2-1 on Saturday in a close battle against Arlington Soccer Association, the Spirit Academy – VA U-14s bounced back on Sunday to come away with three points in their match against Long Island SC, with goals from Briseis Gomez and Hannah Harms en route to a 2-1 victory. The Spirit Academy – VA and MD U-16/17 teams faced off against one another on Sunday at Lake Fairfax Park. An 18th minute goal from Nina Otto sent the VA Academy into the halftime break with a 1-0 lead, only to have the score equalized in the 50th minute by MD’s Jonna Folmar. Strong defensive efforts kept the game leveled throughout the rest of the way, ending in a 1-1 draw. At the U-18/19 level, the Spirit Academy – VA squad defeated their MD club-mates by a 4-2 scoreline in a fast-paced offensive affair. Goals from Camryn Taylor (29′) and Margaret Beckman (38′) spotted VA a 2-0 lead heading into halftime, but MD countered shortly after the break with a 55th minute goal by Brenda Aleman on a blistering long range strike. VA forward Gabrielle Robinson answered Aleman’s highlight reel strike with back-to-back goals in the 62nd and 67th minutes, putting the game out of reach via her second half brace in short order. MD’s Camber Hayes finished the scoring in the 72nd minute, before both defenses held strong the rest of the way. See below for a look ahead at the eight total Spirit Academy games coming up this weekend, all taking place on Saturday, October 20 in Northern Virginia.